The House reconvened at 9 AM today. The House considered amendments to and passed (260-163) H.R. 527 — "To amend chapter 6 of title 5, United States Code (commonly known as the Regulatory Flexibility Act), to ensure complete analysis of potential impacts on small entities of rules, and for other purposes." The House has recessed and will reconvene on Monday, Feb 9 at 1:00 PM. The Senate reconvened at 10:30 AM today and resumed consideration of the motion to proceed to H.R. 240, the House-passed Homeland Security Appropriations bill. At 11:30, Democrats filibustered the motion to proceed to the bill for a third time, meaning the Senate could not even take up the bill to debate it. Yesterday, Democrats made their second filibuster of the motion to take up the bill with a 53-47 vote. Speaking on the Senate floor this morning, Senate Majority Leader Mitch McConnell called on Democrats to stop blocking the Senate from debating the Homeland Security Appropriations bill. “Yesterday,” he said, “Democrats voted once again to protect politicians by blocking Homeland Security funding. I don’t understand why they’d want to block the Senate from even debating a bill to fund Homeland Security. It just doesn’t make sense. You’d think Democrats would at least want to give the Senate an opportunity to make improvements to the bill, if it needs them. “Why would Democrats want to stand tall for the ability of politicians to do things President Obama himself has described as ‘unwise and unfair’? 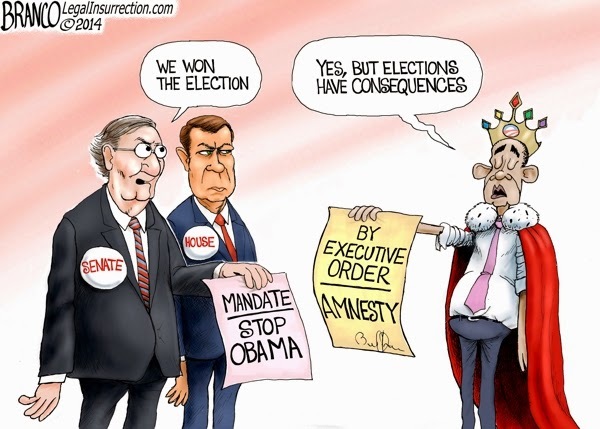 Why would Democrats go to the mat to protect the political class from the consequences of overreach President Obama has referred to as ‘ignoring the law’? “Well, here’s the good news. There’s a way forward. There’s a way to end this Democrat filibuster. All it requires is a little common sense and a little Democrat courage. Prior to the vote, Leader McConnell offered to move immediately to the bill and start considering amendments to the bill immediately. But Minority Leader Harry Reid (D-NV) objected. Americans for Limited Government President Rick Manning today urged Senate Democrats to cease their filibuster of Department of Homeland Security funding: "For the third time, Senate Democrats are jeopardizing homeland security to protect President Obama's unconstitutional action granting amnesty to millions of illegal immigrants. With all the threats facing the homeland, now is not the time to allow politics to interfere with our nation's security. Let the bill come to the floor as is. "If Senate Democrats wish to offer an amendment to the Department of Homeland Security funding, they can do that, but they need to allow the bill to be acted upon. If they can muster the votes to change it, it will be changed. As it stands, funding expires at the end of the month, and the world is not getting any safer. "In the meantime, we urge the Senate majority to continue holding cloture votes on this important piece of legislation so that the process can move forward, and members have an opportunity to make their voices heard. The House has done its job. Now it's time for the Senate to get to work." Wages for border patrol and customs agents? Paid for. Wages for immigration officers and Coast Guard employees? Got it covered. TSA screeners? There may be a lot of gritting of teeth over that one, but it’s paid for as well. It’s all there, President Obama, with the money ready to flow and the paychecks waiting to be covered. All it requires is your party to put it through to your desk and for you to sign it. Tags: Senate, Homeland Security, Democrats, blocking bill, seeking to fun Obama's Executive Amnesty To share or post to your site, click on "Post Link". Please mention / link to the ARRA News Service. and "Like" Facebook Page - Thanks!